The grocery delivery startup was considered "high-tech" because you could order groceries on a website and have them delivered. A darling of the late '90s dot-com boom, WebVan ultimately failed, becoming a poster child for the dot-com bust (the company went bankrupt in 2001) and a cautionary tale about the perils of so-called "last-mile" delivery -- the link in the supply chain that brings products to consumers. Delivery is expensive and inefficient. Unlike most parts of the supply chain, the last mile doesn't scale, especially when a human employee drives a big car to bring one product to one consumer. The "last mile" is ripe for disruption. But how? Companies like Google and Amazon are trying. Google Express picks up goods at stores and delivers them to homes using route-optimization algorithms. Google Express competes against Amazon's AmazonFresh grocery delivery service, which costs a whopping $299 per year -- and that's from a company famous for free delivery of regular packages. Peapod, Fresh Direct, Whole Foods and others are also trying to make grocery delivery work. But none of these companies has really solved the last-mile delivery problem. It's still too slow and expensive. So what's the solution? Drones, right? When Amazon CEO Jeff Bezos revealed his company's drone initiative on 60 minutes in 2013, the world was incredulous. Since then, Google and other tech companies, along with Wal-Mart and other retailers as well as numerous delivery companies like UPS, have unveiled drone-delivery experiments, plans and trials. So the public can be forgiven for believing that the future of last-mile delivery is all about drones. But drones don't scale: They can't fly that far, can't carry that much and need to have their batteries recharged frequently. While drones are great for bringing high-value items (like medicine) to remote places, they're not great for everyday deliveries. The good news is that last-mile delivery can, in fact, scale. Several companies are already testing and showcasing technologies that could make that happen. Auto giant Mercedes-Benz recently rolled out a delivery concept that combines truck and drone delivery with robotic in-truck warehousing. Mercedes' so-called Vision Van, which was created in partnership with a drone startup called Matternet, is an all-electric warehouse on wheels. Two internal racks, which are loaded with packages in the warehouse, are placed in the van. A robotic system grabs the right package based on the next delivery and hands it to the driver through a window while he's still in the driver's seat. Alternatively, the robot system can push the package through a window in the ceiling and into the "arms" of one of two rooftop drones, which then delivers the package to the customer's backyard. This enables faster delivery to homes that are far from the road, and makes it possible for two or three packages to be delivered at once (one by the driver and two by the drones). Another use for the drone port is to deliver a package to the driver that was ordered for same-day delivery after the driver left the warehouse. The robotic in-van warehousing system increases efficiency and cuts down on errors, theoretically. The launching of the drones from vans, rather than from the warehouse, cuts way down on the battery problem. Taken further, you could imagine the rolling drone-base idea leading to large trucks rolling into neighborhoods and then dispatching a fleet of drones, delivery bots and humans to deliver many packages at once. 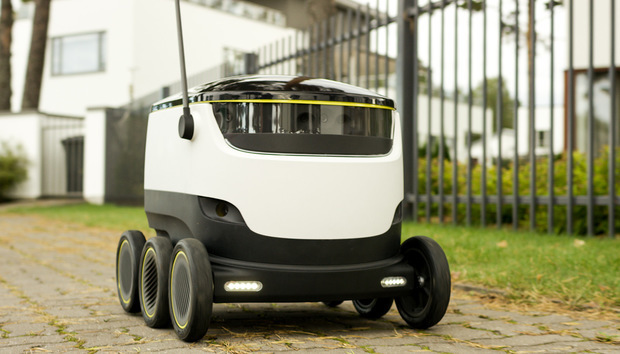 An Estonian company called Starship Technologies makes a robot that looks like an ice chest on wheels for delivering packages and food autonomously or semi-autonomously. Starship co-founder Ahti Heinla, who was one of the original creators of Skype, told me that his delivery robot is inherently safe because it's light and slow (4 mph) and has software that causes it to get out of the way and stop when pedestrians are close. It's also safe because the robot is supervised remotely by humans, who can take over if the robot can't manage. In 8,000 miles of testing, the robots have "encountered" more than 1 million pedestrians and haven’t injured anyone, according to Heinla. The robot is already being tested in Germany, San Francisco, London, Switzerland and elsewhere. Starship delivery robots use nine cameras and GPS technology, as well as an internal navigation and mapping system, to get around on their own. The robots deliver packages within three hours of an order being placed -- sometimes as quickly as 30 minutes afterward -- using public sidewalks, not streets, according to the company. The process is a little like using Uber to hail a ride. People use an app to place the order. They can then track the robot on a map as it makes its delivery. The package is locked in the robot, and a code supplied through the app enables users to unlock it to open the lid and get their packages. Starship is also partnering with Mercedes on a concept called the Robovan, where special-purpose Mercedes vans serve as a "mothership" for up to eight Starship delivery robots. The van pulls over, and the Starship robots deliver the food or packages to multiple houses up to two miles away. The robot is called Domino's Robotic Unit, or DRU, and is controlled by autonomous robot software developed by Marathon, an Australian military contractor. It can drive autonomously, avoiding obstacles, and carry both pizza and beverages up to 12 miles. A code provided to the customer unlocks the pizza compartment. The self-driving, ice-chest approach to robotic delivery is also showing up in hotels. A startup called Savioke makes a robot called the Relay that brings things like towels and coffee to hotel rooms. Savioke already has 12 robots in operation in the U.S. The Relay controls the elevator wirelessly and navigates through the hotel using Wi-Fi and 3D cameras. When it arrives at the guest's room, the robot uses the phone system to call the guest. When the Relay detects the door opening, it opens its own lid so the guest can grab whatever's in there. After making a delivery, it finds its own charger in the lobby and charges itself. In addition to these initiatives, a range of Silicon Valley startups are working on self-driving, ice-chest-like delivery systems. The companies include Fetch Robotics, Marble, Dispatch Robotics and Robby Technologies. In China, e-commerce giants Alibaba and JD.com are also working on robot delivery systems. Cheap, light and safe, autonomous self-driving ice-chest-type robots truly do scale. They can carry more, operate more safely and require less battery power than drones. Everybody loves pizza, and many pizza restaurants deliver. The trouble is that the meat-lover's super pie with everything might be a soggy, lukewarm mess by the time it gets to your house. One Silicon Valley pizza joint is trying to disrupt the soggy pizza industry by turning its delivery trucks into high-tech ovens that bake your pizza en route. Zume Pizza is based in Mountain View, Calif., the same Silicon Valley town that's home to Google -- and, yes, Googlers are customers. Zume Pizza is best known for sensational headlines that claim robots make the pizza, but the reality is that Zume uses industrial robots to spread the sauce and slide the pies into the oven (where they are partially baked). The Zume Pizza truck has 56 ovens inside that fire up individually to 800 degrees four minutes prior to the software-estimated time of delivery, so pizzas are right-out-of-the-oven hot when they arrive at the customer's house. The company also claims that it uses artificial intelligence and machine learning to guess what pizzas customers will order, then preloads those pizzas into the trucks. When customers order, they can have their pizzas in as little as five minutes. Zume claims two more trucks are coming soon and that the company will expand in the Bay Area before going national and international later. Zume Pizza is only partially high-tech. Humans make the crust using a mechanical dough press, add the toppings, load and drive the truck, slice the pizza and carry it to the door. Zume is looking to eventually automate all that as well. The genius behind Zume Pizza is that the process of auto-cooking pizzas in the trucks makes it possible to deliver up to 56 piping-hot pizzas per trip, rather than just a few warm soggy ones. It looks like we're on the brink of making automated and robotic home delivery scale. That will improve customer satisfaction, bring down costs and probably improve safety and the environmental impact of delivery as well. The future of delivery isn't drones. It's robots. And it's coming soon to a door near you!